Does your gum bleed when you brush or floss your teeth? There are many factors which can cause your gums to bleed. Some of these factors are temporary and can be easily controlled. Poor Oral Hygiene – Not brushing or flossing properly and regularly can cause accumulation or build-up of plaque around teeth and gum line. This in turn can cause infection of gums which we commonly refer to as Gingivitis. Good oral hygiene habits and regular dental check-ups can revert early stage of gingivitis. Not flossing regularly – Not flossing every day or flossing too hard can also cause bleeding from gums. Flossing properly and on a regular basis can clear this up in a week. Hard bristled toothbrush – Using a hard bristled toothbrush can also result in bleeding from gums. Use a soft bristled toothbrush. Ask your dentist about what toothbrush is right for you. Medications – Blood thinners decrease blood’s ability to clot. This can result in easier bleeding. If you are on any blood thinners, then you should tell your dentist about it. Pregnancy Gingivitis – Hormonal changes in pregnancy can change the way body reacts to bacteria that cause gum disease. This can cause pregnancy gingivitis in which pregnant women may notice swollen gums and bleeding during brushing. It is advised to get regular dental check-ups and do regular brushing and flossing to help prevent it from bleeding worse. 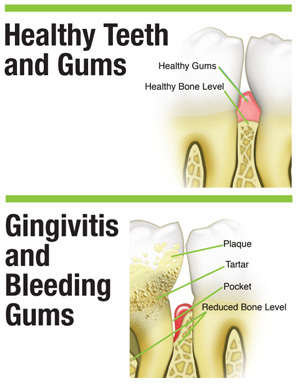 Bleeding gums can be a symptom of gingivitis. Before it develops into more serious stage of gum disease, talk to your dentist and find out best way to help prevent it.